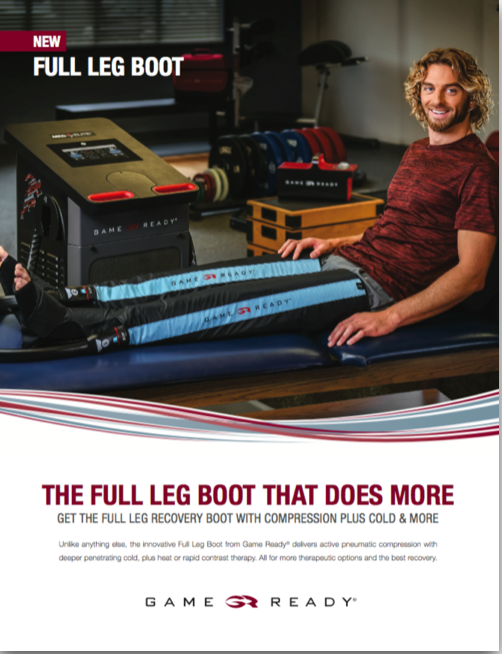 Game Ready’s all-new Full Leg Boot from Game Ready provides more options for recovery and rehab. Patented and proven Game Ready technology helps decrease pain and swelling and stimulate circulation. Now you can train longer and compete harder. The all-new, innovative Full Leg Boot uniquely combines active pneumatic compression with deeper penetrating cold, plus controllable heat or rapid contrast treatment options. For recovery and rehabilitation after sports injury or surgery. About the anatomic, low-profile design based on input from specialists including ATs, PTs, and other sports medicine professionals. Simply fill out the form to the right to get access to the complete brochure now.